An unaltered photocopy of your DD-214, OR WD AGO 53-55, OR other military issued document clearly displaying your National Defense Service Medal award or eligibility. Don't forget to include an unaltered COPY of your DD-214, DD-215 or other pre-arranged document(s). If you fall into one of the above categories you are automatically authorized the NDSM by Executive Order. No DD-214 update is required. A. Authorized by Executive Order. 10448, as amended and Executive Order 12776 (references (r) and (1111)). A. Authorized by E.O. 10448 and the Secretary of Defense Memorandum, (references (r) and (s)). (1) Honorable active and Selected Reserve service as a member of the Armed Forces of the United States for any period between June 27, 1950 and July 27, 1954, or between January 1, 1961 and August 14, 1974. During those periods, Service members in the following categories shall NOT be eligible for the NDSM: (a) Members of the Guard and Reserve Forces on short tours of active and Selected Reserve duty to fulfill training obligations under an inactive duty training program. 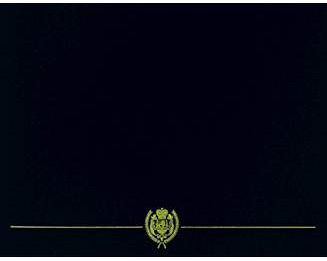 (b) Any Service member on TDY or TAD to serve on boards, courts, commissions, and similar organizations. (c) Any Service member on active and Selected Reserve duty for the sole purpose of undergoing a physical examination. (2) Honorable service as a member of the Armed Forces of the United States for any period between August 2, 1990, and November 30, 1995. Service members on active and Selected Reserve duty, members of the Selected Reserve in good standing, and members of other than the Selected Reserve who were called to active and Selected Reserve duty shall also be eligible. During that period, Service members in the following categories shall NOT be considered eligible: (a) Any Service member on active and Selected Reserve duty for the sole purpose of undergoing a physical examination. (b) Any member of the Individual Ready Reserve, the Inactive National Guard or the Standby or Retired Reserve whose active and Selected Reserve duty service was for training only, or to serve on boards, courts, commissions, and similar organizations. b. Exceptions to policy criteria in subparagraphs C. 1.a. (1) and (2), above, maybe granted by the Military Departments. c. Notwithstanding these limitations, any member of the United States Coast Guard or the Reserve or Guard Forces of the Armed Forces who, between January 1, 1961 and August 14, 1974, became eligible for award of either the AFEM or the Vietnam Service Medal or between August 2, 1990 and November 30, 1995, became eligible for award of the Southwest Asia Service Medal shall be eligible for award of the NDSM. 2. Subsequent Award. A bronze service star shall be worn on the suspension and service ribbon of the NDSM by Service members who earned the medal during two different periods of eligibility (e.g., during the period 1961 through 1974, and during the period 1990 through 1995). 3. Posthumous Awards. The NDSM may be awarded posthumously. 1. Description: On a bronze medal, 1 inches in diameter, an eagle displayed with inverted wings standing on a sword and palm branch, all beneath the inscription "NATIONAL DEFENSE". On the reverse is a shield taken from the Coat of Arms of the United States with an open wreath below it, the right side of oak leaves and the left side of laurel leaves. 2. Ribbon: The ribbon is 1 3/8 inches wide and consists of the following stripes: 7/16 inch Scarlet 67111; 1/32 inch White 67101; 1/32 inch Old Glory Blue 67178; 1/32 inch White; 1/32 inch Scarlet; center < inch Golden Yellow 67104; 1/32 inch Scarlet; 1/32 inch White; 1/32 inch Old Glory Blue; 1/32 inch White; and 7/16 inch Scarlet. (1) Guard and Reserve forces personnel on short tours of duty to fulfill training obligations under an inactive duty training program. (2) Any person on active and Selected Reserve duty for the sole purpose of undergoing a physical examination. (3) Any person on temporary active and Selected Reserve duty to serve on boards, courts, commissions and like organizations or on active and Selected Reserve duty for purposes other than extended active and Selected Reserve duty. b. The National Defense Service Medal may be awarded to members of the Reserve Components who are ordered to Federal active and Selected Reserve duty, regardless of duration, except for the categories listed above. Any member of the Guard or Reserve who, after 31 December 1960, becomes eligible for the Armed Forces Expeditionary Medal, Vietnam Service Medal or the Southwest Asia Service Medal is also eligible for the National Defense Service Medal. a. Medal (regular size): MIL-DTL-3943/234. NSN 8455-00-281-3214 for set which includes regular size medal and ribbon bar. b. Medal (miniature size): MIL-DTL-3943/234. Available commercially from certified manufacturers. c. Ribbon: MIL-DTL-11589/97. NSN 8455-00-264-1478.
d. Lapel Button: MIL-DTL-11484/185. Available commercially. 5. Background: a. The National Defense Service Medal (NDSM) was established by President Eisenhower per Executive Order 10448, dated 22 April 1953, for service between 27 June 1950 and a date to be announced. On 17 June 1954, the Chief of Staff approved establishment of 27 July 1954 as the termination date for award of the NDSM. Executive Order 11265, dated 11 January 1966, amended Executive Order 10488, to include a termination date and authorized the Secretary of Defense to establish periods of eligibility subsequent to 31 December 1960. Eligibility for award, commencing with the period after 31 December 1960, was established by DOD Directive 1348.7, dated 1 April 1966, and terminated effective 15 August 1974, per letter from Manpower and Reserve Affairs, subject: Termination of Eligibility for the National Defense Service Medal, dated 30 June 1974. The NDSM was again authorized by memorandum, dated 20 February 1991, from Secretary of Defense Cheney for active and Selected Reserve service on or after 2 August 1990 with no termination date established. The termination date was later established as 30 November 1995.
b. The Heraldic Division, Quartermaster General's Office, was requested to provide proposed designs for the NDSM and designs created by Mr. T. H. Jones were submitted to the G1 on 26 May 1953. A committee appointed by DOD, which included representatives of all services, met on 27 May 1953 and 3 June 1953 and selected the design for final approval. The eagle, our National emblem, together with the shield of the Coat of Arms of the United States is used to symbolize the defense of the United States. The combination of oak and palm leaves signify strength and preparedness. c. Order of precedence and wear policy for medals awarded to Army personnel is contained in AR 670-1. Policy for awards, approving authority and supply of medals is contained in AR 600-8-22. Source: The provisions of Executive Order 10448 of Apr. 22, 1953, appear at 18 FR 2391, 3 CFR, 1949-1953 Comp., p. 935, unless otherwise noted. 2. The regulations prescribed by the Secretaries of the Army, Navy, and Air Force pursuant to paragraph 1 hereof shall be uniform so far as practicable and shall be approved by the Secretary of Defense. The regulations prescribed by the Secretary of Transportation pursuant to paragraph 1 hereof shall, so far as practicable, be uniform with the regulations prescribed for the other armed forces. 3. 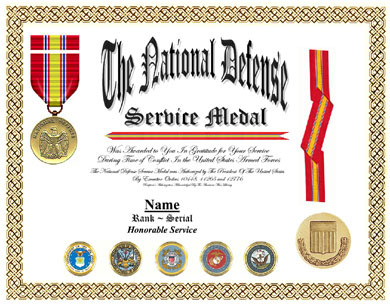 Those persons entitled to wear the National Defense Service Medal for service after June 26, 1950, and before July 28, 1954, or for service during any designated period after December 31, 1960, are also entitled to wear a bronze star on their National Defense Service Medal ribbon for each additional period of active and Selected Reserve duty designated by the Secretary of Defense pursuant to paragraph 1 as being a period for which active and Selected Reserve military service merits special recognition. 4. The National Defense Service Medal may be awarded posthumously. WASHINGTON, May 2, 2002 -- All service members, including Coast Guardsmen, who were on active and Selected Reserve duty on or after Sept. 11, 2001, are eligible to wear the National Defense Service Medal, defense officials announced May 1. "The sacrifices and contributions made by the armed forces in direct response to the terrorism attacks on the United States and to the long-term resolution of terrorism merit special recognition," said Deputy Secretary of Defense Paul Wolfowitz. Members of the National Guard and Reserve may also be awarded the medal if they were on federal active and Selected Reserve duty on or after Sept. 11. Exceptions are if they were on active and Selected Reserve duty for training, on short tours of active and Selected Reserve duty to serve on boards, courts, commissions and the like, or on active and Selected Reserve duty solely to get a physical exam. Service members previously have worn the National Defense Service Medal for duty in three distinct periods, starting with the Korean War era, defined as June 27, 1950, to July 27, 1954. Executive Order 11265 authorized the secretary of defense to establish periods of eligibility after Dec. 31, 1960. The second period of eligibility was a loosely termed "Vietnam War era" of Jan. 1, 1961, to Aug. 14, 1974. The medal was again authorized by a memorandum from the secretary of defense dated Feb. 20, 1991, for active and Selected Reserve service on or after Aug. 2, 1990 -- the beginning of Operation Desert Shield. The termination date was later set as Nov. 30, 1995. No closing date has been established for this newest period. Eligible service members can receive and wear the award immediately. Those already awarded the medal for an earlier period will receive a bronze service star device to attach to the ribbon. Established by President Eisenhower on April 22, 1953, the National Defense Service Medal indicates military service during a time of war or conflict regardless of the service member's station of duty. Images, a description and history of the National Defense Service Medal http://www-perscom.army.mil/tagd/tioh/medals/ndsm.htm are on the Web at http://www- perscom.army.mil/tagd/tioh/medals/ndsm.htm. 2. by striking "additional period of active duty" and inserting in lieu thereof "additional period." Nothing in this order shall be construed to impair or otherwise affect the exercise of authority granted by Executive Order 12776 of October 8, 1991. GEORGE W. BUSH THE WHITE HOUSE, March 28, 2003.
a. Ready Reserves: Consists of Selected Reserve and members of the Individual Ready Reserve (IRR). (1) Selected Reserves: Units and Individual Mobilization Augmentees (IMA's) of the Ready Reserve. Have priority for training and equipment. All Selected Reservists are in an active status. (a) Guard/Reserve Units. Units manned and equipped to serve and/or train either as operational or as augmentation units. (b) Individual Mobilization Augmentee (IMA): An Air Force Ready Reservist assigned to a specific position within the active force which the reservist would assume upon mobilization or call- up. or in the Selected Reserve and have some period of their military service obligation remaining. In addition there are some individuals in the IRR voluntarily, for hardship or in special non-pay programs that provide a variety of professional assignments and opportunities to earn retirement points and military benefits. (a) Trained individuals- Members of the IRR who are judged to be trained and available for mobilization. Includes those members leaving active duty or transferred from the Selected Reserve within 1 Year. (b) Untrained Individuals- Members of the IRR who are not locatable and any other member whose status is not known or whose mobilization probability is uncertain. (c) In Training- also includes personnel who are participating in officer training programs or in the Armed Forces Health Scholarship program. b. Standby Reserve: May only be ordered to active duty involuntarily in time of war or national emergency declared by Congress. It consists of personnel who maintain their military affiliation with being in the Ready Reserve, who have been designated key civilian employees or who have a temporary hardship or disability. These individuals are not required to perform training and are not part of units. They would generally be mobilized to fill manpower needs in specific skills.